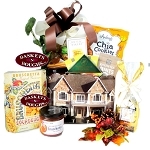 Our Thank You Gift Baskets will be sure to extend your appreciation in a business to business gift, business to client gift, gifts for when a good friend really comes through, for referrals and more! The list of reasons for appreciation is endless! !